Jean Augustin Ernouf was born as Manujel Louis Jean Augustin Ernouf and he had a varied career in France in the 18th and 19th century. He joined the French army as a volunteer in 1791 and within few years he was promoted via a lieutenant of the infantry of the volunteers in 1791 via captain in 1792 to the aide-de-camp of General Barthel in 1793. During the war of the 1st coalition he was sent to Cassel in 1793 in order to support the French position. When the Duke of York sieged Dunkirk and the city Bergues, Jean Augustin Ernouf joined the commanding Jean Nicolas Houchard with a troup of 1000 men. Together they could relief Dunkirk and Ernouf was nominated to a Brigadier General shortly afterwards. In addition he also became the chief-of-staff of the Army of the North. His combatant Jean Nicolas Houchard fought successfully against the Dutchmen by Menen several days later. But only two days after this victory he suffered defeat against the Austrian General Beaulieu on September15, 1793. In November 17, 1793 he was executed by the guillotine. At the end of 1793 Jean Augustin Ernouf gave some advice to Jean-Baptiste Jourdan which led to the end of the siege of Maubeuge, later he took actively part at the battle of Hondschoote. This earned him the promotion to Major General on December 13, 1793. When Ernouf and his commanding officer Jean-Baptiste Jourdan did not order an aggressive pursuit of the defeated they were accused to be followers of the counter-revolution and became disrated. But only one year later after the end of the so-called Reign of Terror he became rehabilitated again and with it his military rank. He demonstrated a great talent for logistics in the next years and he became the chief-of-staff of the Army of the Moselle and the army of Sambre and Meuse. Jean Augustin Ernouf was riding with the Army of Observation in 1798 when they conquered the Rhine river. This was considered to be a violation against the treaty of Camo Formio which resulted in the was of the 2nd coalition. The Army of Observation was renamed into the Army of the Danube and Jourdan marched together with Ernouf against the Habsburgs. Because the Habsburg army was superior numerically the French army had to withdrew to the Black Forest. When Jourdan returned to Paris to mobilize re-inforcement Jean Augustin Ernouf took over the command of the army. Finally he was replaced by André Masséna as commander and Ernouf joined the campaign in Switzerland as a chief-of-staff and was garrisoned in central Switzerland and Zurich. 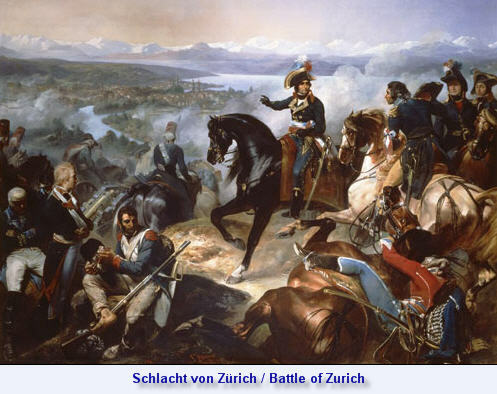 The French conquered the Russian General Alexander Rimsky-Korsakov near Zurich during the 2nd battle of Zurich. 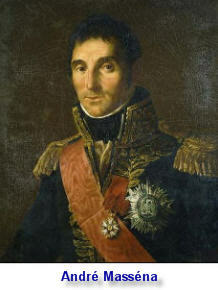 Jean Augustin Ernouf became a Grand Officer of the Legion of Honor in 1804 and shortly afterwards his career took a completely other directon when he was announced as a Captain General of Guadeloupe and Saint Dominque by Napoleon I. His main task was to restore the order and trading again which was seriously affected by the growing oppositon against the prevailing slavery. He manage to restore the order again within a year and was able to carry the agricultural production successfully. He made businesses with refugee planters and he operated the Swedish island St. Barts as well. From there he let privateering British and American vessels regularly and with the sales of those ships he generated approximately 80 Million Francs. When the Brits conquered the French colony Martinique in 1809 this was also a threat for Guadeloupe. The Brits blocked the island and the civilians and the members of the army came near to starvation. 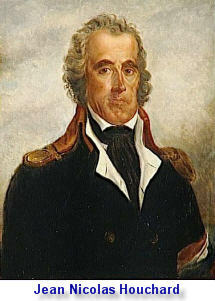 The Brits started the invasion of Guadeloupe in January 1810 and after a short resistance Jean Augustin Ernouf had to capitulate. He was brought to Britain as a prisoner but one year later he could return to France through a prisoner exchange. But the time of uncertainty was not over with this because he fell from favour with Napoleon I and was accused of abuse, embezzlement and treason. 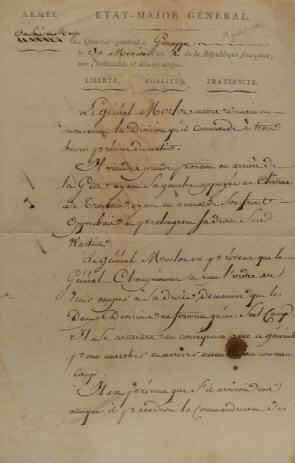 Jean Augustin Ernouf spent 23 months in a French prison, in the meantime the court discussed the process strategy. But before the judicial proceedings started in which Ernouf wanted to proof his innocence the empire of Napoleon fell and the Bourbons came back to the power. The Bourbons exposed the ongoing trial because for want of evidence and Ernouf served for the Bourbons. He was created chevalier of Saint-Louis and finally he became Inspector General of Infantry in Marseille. Under general Charles, Duke of Angoulême he got the command of the first Corps in 1815. During Ernouf was on an inspection Napoleon returned from his exile on Elba and landed in Cannes. Many soldiers of Charles, Duke of Angoulême joined Napoleon and Charles, Duke of Angoulême had to capitulate. 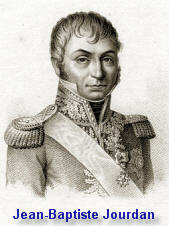 Also Ernouf's former companion André Masséna joined Napoleon's side. Napoleon revoked all ranks of Jean Augustin Ernouf and he was released from the army. But when Napoleon lost the battle of Waterloo the Bourbons came back to the power again and with it Ernouf got back his ranks and functions as well. In 1816 King Louis XVIII granted Jan Augustin Ernouf the title of Baron and awarded him with the "Commander Cross of the Order of Saint Louis" which allowed him to wear a red slash. At the same time it guaranteed a pension and the heredity of the title to his sons and grandsons. In the same year Ernouf got the command of the third division at Metz. Jean Augustin Ernouf was elected into the Chamber of Deputies of France in 1818. Four years later he retired. 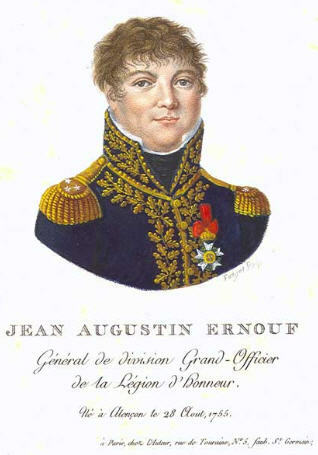 Jean Augustin Ernouf's son Gaspard was also active at the military, his grandson Alfred Auguste Ernouf was a well-known historian of the 19th century. Betascript Publishing released a biography about Jean Augustin Ernouf. 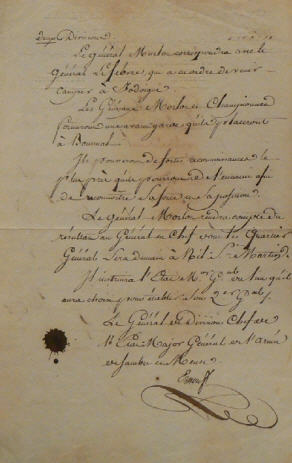 Here is reproduced a two-sided written letter from 1794 which was signed by Jean Augustin Ernouf.